Before laying onto Calcium Sulfate screeds it is vital to ensure that the moisture content is at the correct level for the required floor finish. Typical values for moisture sensitive floor finishes are less than 0.5% Water by Weight or less than 75% relative humidity (RH) for impermeable floors and less than 1% w/w for more permeable floors. When fast-track tiling is required consider the use of a Damp Proof Membrane such as BAL DPM. 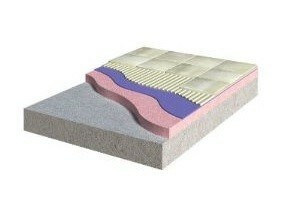 BAL DPM can be used on anhydrite screeds up to 87% RH.